Emmeline Jardine and Immanuel Winter are only months away from achieving their dreams, she will enter debutant society and he will receive a degree from Oxford, but a day at the Thames transforms their lives forever, intertwining their souls and putting them into the path of a predator. Ripped from the comfort of the world they know, Emmeline and Immanuel are thrust into a struggle for their survival. Even though they escape, Immanuel is forever altered by his time in captivity. Gradually he begins to settle into a normal life as the coroner’s assistant until he comes face to face with the man who nearly destroyed him. Unaware of what he is capable of, Emmeline is infatuated with the dashing madman and follows him deeper into a world of corrupt mediums. When a murderer masquerading as a monster begins to hunt beautiful Spiritualists, Immanuel knows the key to stopping him lies within the girl who shares his soul. 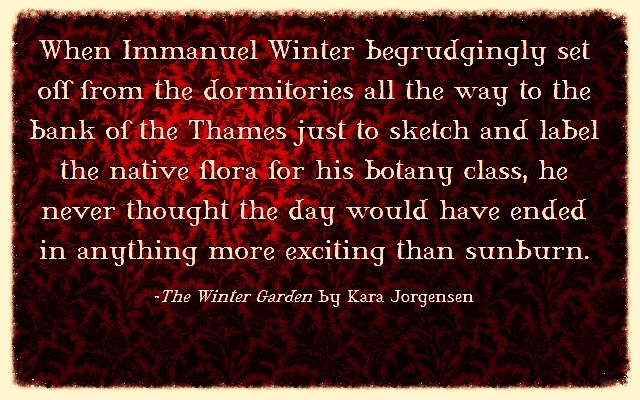 The Winter Garden is not a direct sequel to The Earl of Brass, but it overlaps timelines with the first book and shares many of the same characters. Immanuel and Emmeline have been part of my life for a long time and began their infancy as completely different circumstances and with rather different personas. It has been an amazing few months watching them transform and develop into real beings with lives, motives, and feelings. Over the next few weeks and leading up to the book’s release, I will post character profiles and sneak peaks. The image at the top of the post is the first line of The Winter Garden, and eventually all of chapter one will be put online for your viewing pleasure. As a side note, I am revamping my website, and hopefully, it will be up and running in a few days. If you would like to add The Winter Garden or The Earl of Brass to your Goodreads list, click here. Before I end my post, I must apologize for my absence this past week. Graduate school has just started, and I am still figuring out how to juggle schoolwork, my job, writing, and social media. In a few weeks, I will be back into the swing of things.